SD Removable Memory : The supplied 1GB SD Card provides an ample amount of memory and the durability and reliability you need in a removable media card. The DS-3400 also supports SDHC memory cards. 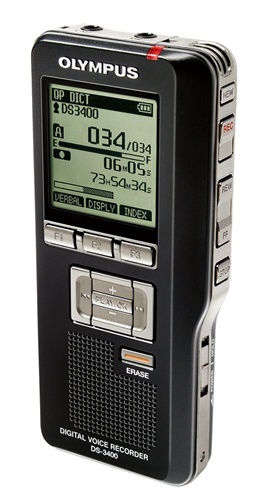 Three Programmable Buttons : Customize the DS-3400ï¿½s functions to suit your dictation needs. The recorder firmware can also be programmed for additional functionality and flexibility. Appending - Adding new dictation to the end of a file. Overwrite Recording - Sections of dictation in a previously recorded file can be overwritten from any point within a file. The overwritten sections will be erased. Insert Recording - Inserting additional dictation into a previously recorded file. Push Button Operation is quiet and easy to use, resulting in high performance, comfort, and increased productivity. Dictation Features : Editing functions (overwrite/insert/delete/partial erase/new file button). Two Recording Mode. QP ( Quality Playback ) mode and SP (Standard Playback ) mode. Centralized navigation buttons for easy data input and settings. Built in Variable Control Voice Actuator ( VCVA ) function. Large LCD supports and displays multiple languages, including English, French and Spanish. Verbal comment function lets you instantly search and play back verbal comments using DSS Player software. I ordered 2 of these recorders. The day after my order was placed the company called to say that the DS-3400 wasn't available but they would ship the DS-3500 in it's place at no addition cost to me. Great way to do business for the customer. Bought this as a replacement for a 2300. It has some nice new features but the best part for me was that the controls felt familiar. Controls are intuitive. I was able to start using it without reading the manual.